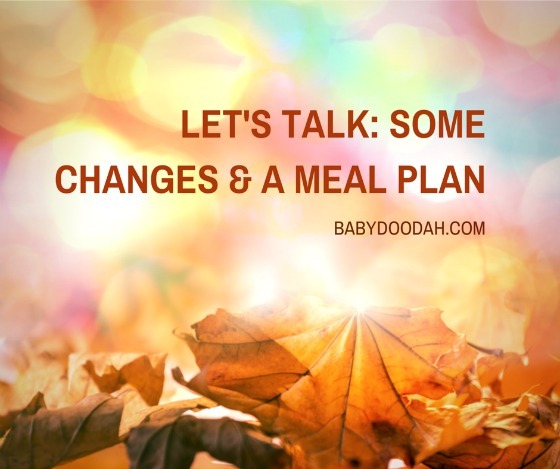 Let's Talk - Some Changes & a Meal Plan - Baby Doodah! Life is full of changes, and I don’t always cope so well with them – but if I want to become a successful solopreneur certain things need to evolve. I have always enjoyed blogging, I’ve had 3 or 4 different blogs in my lifetime, and I’ve enjoyed writing for each one, but I always seemed to run out of post ideas. I never looked at the full picture, or the different angles that a topic can come from. Even with Baby Doodah! I haven’t fully grasped how many readers I could reach if I just buckle down and really look at this like a business. Yes, it is a hobby and I enjoy every single minute that I get to be at the keyboard, writing (90% of the time), but I do want to gain audience members, too. Lately, I’ve been doing a lot of reading, learning and personal development. I’ve been reading blog upon blog about how important it is to have a business plan for your blog. That is literally something I NEVER considered for my blog, in fact – even right now – I have NO Idea how to go about doing that. I have an idea, but I am one of those people who needs specific instructions before I can move forward. I’ve managed to find a couple of fantastic resources (here are a few for your viewing pleasure, How to Build a Blog Business Plan and How to Create a Successful Business Plan for Your Blog) that will help guide me in the right direction, and I can’t wait to get started. It’s essentially grown-up homework for something that I really enjoy doing, that can only lead to success. Right!? Anyway, I wanted to come clean to you, my loyal and valued readers. I love keeping you up to date on everything I have planned, because it is you that I write for. I really hope you stick around!! There you have it!! My confession on changes coming and my yummy weekly menu. We do have a lot of repeats this week, but why mess with what’s broken, right!? I’m linking up with Laura from Mommy, Run Fast! and Jill from jillconyers.com. And, also linking up with the Motivate Me link-up hosted by Janice from Fitness Cheerleader and Rachel from RunningRachel.com. How do changes of any kind make you feel? If you are making a meal plan this week, what’s on it? Looking for a quick, easy and FREE way to get your news? Check-out theSkimm and sign-up for your daily email box delivery of the world’s news, plus if you share your birthday, you get it listed at the bottom of the newsletter on your day. It’s like celebrating with thousands of people!!!! ← Social Media Saturdays – Join the Link-up Fun! Jillian, I love this post. Such an honest look at how we need to change how we perceive and approach things in order to really see growth. That, and your meal plan sounds delicious. Wishing you success with your new blog schedule. Thank you so much for the link to my site. P.S. I love #AdultHomework too. Oh my gosh!! Regina! I’m so SO honored that you stopped by my blog & that you commented. You’ve made my day!! Thank you!!! Hi Jillian, I am so glad you found my blog earlier this year – I’m in the same boat as you, trying to treat the blog as a business. (Though I think you and I may have followed each other before in past blog lives too). Thank you for sharing these resources! I’m sending you an email that you may also find interesting. On another note – your meal plan looks awesome! I have a new #MotivateMe Monday link up happening on my blog that you may be interested in linking up to as well. Have a great day and an awesome week! Hi Janice! I’m really glad I found your blog, too and I’m really excited to join in with your link-up. I’ll keep an eye out for your email, I’m always looking for more information on how to excel as a business owner. Thanks for visiting! Looks like a great meal plan! Way to go! Thanks for linking up! My pleasure! Thanks for visiting, Rachel! I love change! Learning all that I can about blogging as a biz so thanks for sharing the links. Have a wonderful Tuesday! Hi Jill!! Maybe I’ll take a lesson from you, I am still not a fan of change. haha Thanks for stopping by!